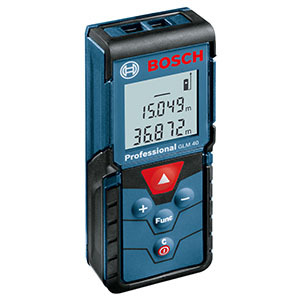 Instant information for most common laser measure functions, including area, distance, length, volume, continuous measurement and addition/subtraction. User doesn’t need two measurements to get the third for area measurement. Back lighting allows user to see information in dark areas with better resolution. Handy pocket-size design that makes unit easy to use anywhere; package includes pouch, hand strap and target cards. Measuring distance extends to 135 Ft. with +/- 1/16 In. accuracy.